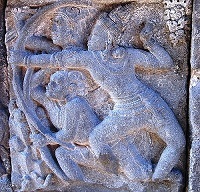 Chandra (Moon) and Surya on their respective Chariots in the inner sanctum of the Nandi temple. Kshatriyas in epic war. Squirrel climbing a tree. Pustakasala (also known as Kimpulan temple) is a 9th to 10th century Hindu temple located in the area of Universitas Islam Indonesia (Indonesia Islamic University or UII), Kaliurang road, Kaliurang, Sleman, Yogyakarta, Indonesia. The temple was buried about five metres underground. Parts of the temple have been excavated to reveal square andesite stone walls and statues of Ganesha, Nandi, and Lingam-Yoni. The temple was accidentally discovered on 11 December 2009 during land excavations to lay foundations for the construction of a new university library.The discovery drew public attention and sparked excitement and curiosity. The news instantly drew many visitors to the site. Archaeology office (BP3) in Yogyakarta feared that large numbers of curious visitors would harm the excavation site, and feared the looting might take place. As the result, the area was surrounded with tin fences and closed; it is presently off-limits for visitors. Like the temples of Sambisari, Morangan and Kedulan, the temple is thought to have been buried by an ancient volcanic eruption from nearby Mount Merapi about a millennia ago. The discovery of this temple was the most exciting archaeological findings in Yogyakarta recently, leading to speculation about whether other ancient temples still lie underground in the vicinity, buried under Mount Merapi volcanic ash. Further study and archaeological excavation are currently in progress by the Yogyakarta Archaeological office. So far the temple clearly shows its Hindu Shivaistic nature, and by the style of carving and statues strongly suggests construction somewhere around the 9th to 10th century, during Mataram Kingdom period. During the discovery, the temple was initially known to public as Candi UII (Universitas Islam Indonesia temple), because it was discovered on the UII campus grounds. Later the Archaeological Office of Yogyakarta (BP3) named the temple Candi Kimpulan after Kimpulan village, the location of the site. However the UII Wakf Foundation Board suggested another name; Pustakasala which means "library" in Sanskrit. The suggested name was meant to emphasize its history of discovery, as the temple site was originally meant to be the university library. The name "Pustakasala" was also chosen to emphasize the education nature the university. 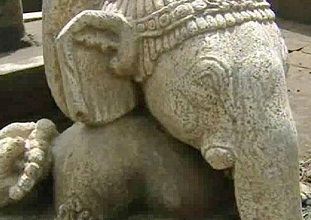 Moreover the Ganesha statue was discovered in the site, since in Java, Ganesha traditionally known as the god of learning, intellectual, wisdom, and knowledge. Archaeologists in Indonesia have uncovered a 1,000-year-old temple that could shed light on the country's Hindu past. The intricately carved statues and reliefs are some of the best preserved in Indonesia, but the dig is being conducted under tight security to protect the site from well-organised relic thieves. The temple was found on the grounds of Yogyakarta's Islamic University as workers probed the ground to lay foundations for a new library, and they realised the earth beneath their feet was not stable. 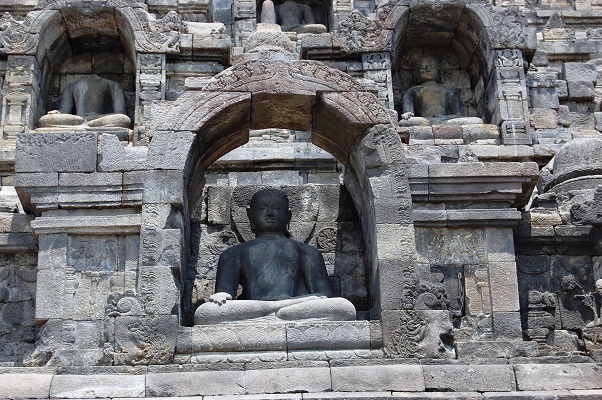 The intricately carved statues and reliefs are some of the best preserved in Indonesia. Archaeologists in Indonesia have uncovered a 1,000-year-old temple that could shed light on the country's Hindu past. UII Wakf Foundation Board suggested another name; Pustakasala which means "library" in Sanskrit. Digging soon revealed an extraordinary find: three metres underground were still-standing temple walls. Heavy rains then exposed the top of a statue of the god Ganesha in pristine condition. A few weeks into the excavation, archaeologists are declaring the temple and its rare and beautiful statues an important discovery that could provide insights into Indonesia's pre-Islamic culture. "For example, looking at where the statues are placed in this temple, they are in their original positions, unlike the other temples. "This temple is important for understanding the culture of our ancestors." This temple is a quite significant and very valuable because we have never found a temple as whole and intact as this one. A volcanic eruption is thought most likely to have covered the temple around the 10th century, about 100 years after it was built. The eruption preserved its statues and reliefs in better condition than almost everything else discovered in Indonesia from that period, including the Borobodur and Prambanan temple complexes. But now that they are exposed, the temple's contents need to be protected with 24-hour security. Last November, thieves plundered the nearby Plaosan Temple. The heads of two rare Buddhist statues were stolen, to be traded by organised syndicates dealing in artefacts. Tri Wismabudhi from central Java's culture and heritage agency says temple thieves are robbing Indonesians of a piece of their history. Borobudur is commonly considered a Buddhist structure, yet its first and second terraces were Hindu constructions begun in 775 AD. as a large step pyramid by Hindu King Indra of the Shailandra Dynasty. The colossal temple at Borobudur, which apparently started as a Hindu temple and was converted to a Buddhist place of worship. This world’s largest Buddhist stupa was actually built on Hindu foundations, a series of three stone terraces which began life in 775 AD as a large step pyramid. When the Buddhist Sailendras took over the site fifteen years later, building resumed on top of the three terraces to become their own temple. 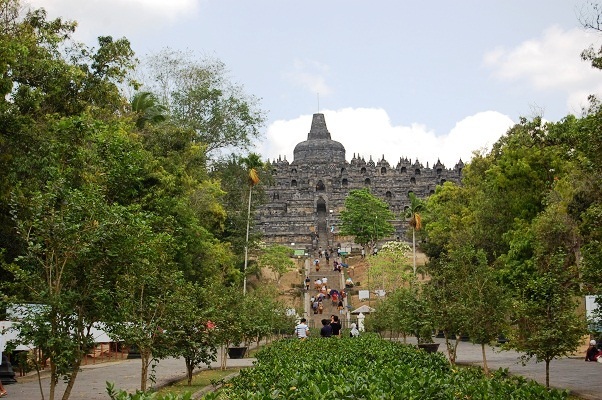 Borobudur temple was originally built in the shape multilevel scheme. It seems designed as a pyramid-shaped like a ladder, but then this design changed. As evidence is the existence of the scheme dismantled. "To us, archaeological sites like this are archaeological data, so if the data is missing or incomplete, that means the history of the nation is also missing," he said. "People don't understand that. That's why they steal, because they don't realise how important this is for us as a nation." 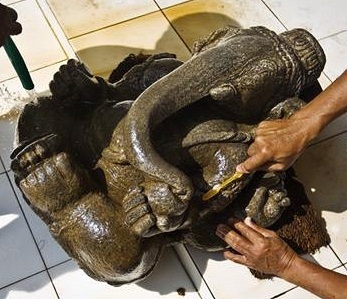 At the Kimpulan temple on the campus of Yogyakarta's Islamic University, the statue of Ganesha is being kept slightly buried to make it harder to steal. It could sell for up to $250,000 on the black market. The university wants to open the site to the public once the dig is complete. The library that was destined for the site will be redesigned to incorporate the Hindu temple. (source: New York times article). With little exposure to the real thing, Ruth St. Denis (1879 - 1968) dazzled audiences across America and Europe with her creation of "Radha" and other Indian dances. After first appearing on the western stage in 1838, Indian dance once again surfaced prominently in the early 20th century. As with the bayaderes in 1838, the performers of the troupe in 1906 were of Indian origin. This time, however, their lead dancer and choreographer was not an Indian, but a young American named Ruth St. Denis. St. Denis' Indian dance pieces were attempts to convey Hindu philosophical ideas to Western audiences in a manner that would be intelligible to them. These were not authentic Indian dances, as were those of the bayaderes, but were inspired by Indian themes and included the sinuous and rippling arm motions and graceful body movements and postures of classical Indian dances. St. Denis abundantly used Indian dress materials and jewelry and designed and wore long flowing costumes. To create an Eastern ambience, she used Indian brassware, ornate columns, flowers, incense and other creative stage props. St. Denis was a gifted dancer whose artistic creations demonstrated how to relink dance with spiritualism at a time when Western dancers had generally cut themselves off from its religious and spiritual origins. She had studied and was deeply inspired by non-Western and especially Indian civilization at a time when a tendency--much later dubbed as "Orientalism" by Edward Said--prompted her contemporaries to look upon non-Western people as inferior, backward and static or even weird and animalistic. Ruth St. Denis's relative open-mindedness was thus a fresh departure that helped free Western dance from its shackles, elevated it onto a higher plane and placed important and even profound facets of Indian culture before Western audiences. But her plan changed when a turn towards Indian dancing started her on a journey to increase her knowledge about India, and especially Hindu culture. As she went about extracting information from the East Indian dancers she met in Luna Park, lapping up knowledge about India from books in the Indian section of Astor Library and seeking help from experts such as the extraordinary Indophile Edmund Russell, she became aware of the wonder that was India. She was particularly fascinated by the Hindu temple dancers, devadasis; and she felt she had hit upon a universal fundamental truth in the Bhagavad Gita's declaration that inner peace and freedom from sorrow lay not in the bottomless whirlpool of worldly pleasures, but in shaking off the yoke of the flesh and performing one's duty with detachment. She returned to the US soon afterward, taking her Indian dances all over the country. The general response of her countrymen was positive, and in her homeland she impressed art historian Dr. Ananda Coomaraswamy and Indian poetess Sarojini Naidu. Even Rabindranath Tagore was sufficiently impressed to request St. Denis to stay on and teach dance at Viswa-Bharati University in Shantiniketan. Evaluating the impact of her many tours, or "journeys," St. Denis wrote: "It took many years to realize the full effect of the pioneering work on these journeys. I have been told by Hindus that the value of these early tours, when their Hindu culture was introduced through the dance, can scarcely be overestimated. (source: How India Inspired a Dance Pioneer - By Dr. Kusum Pant Joshi - hinduismtoday.com).